Written by CEMB on May 19, 2014 . Posted in Press Releases, Resources. 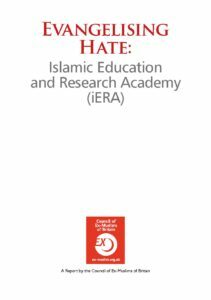 A new report from the Council of Ex-Muslims of Britain “Evangelising Hate” exposes the Islamic Education and Research Academy (iERA) as a Hate Group. You can read the report here. Whilst iERA purports to be a missionary-like charitable organisation, it is in fact a “soft Islamist” group, which acts as the Islamist movement’s public relations arm by promoting and normalising Islamist values and norms, including inciting hatred against ex-Muslims, gays, Jews, women, non Muslims and a majority of Muslims who do not share their values. In Britain and the west, groups like iERA use multiculturalism (as a social policy that segregates “communities”) and cultural relativism as well as the rights language of diversity, tolerance and inter-faith dialogue to increase influence and access. Any opposition to their theocratic aims are met with accusations of racism and Islamophobia. This timely report is being published just as the Charity Commission is investigating the group. “This long-needed report provides a complete picture of the activities of the iERA, its promotion of hatred against women, gays, non-Muslims, ex-Muslims and liberal Muslims, and its affiliation with Islamists who have called for violence or have been involved in violent jihad themselves”, says Chris Moos of the LSESU Atheist, Secularist and Humanist Society. He adds: “As a student who has experienced the violent tactics of the iERA myself, I find it unacceptable that this group continues to be the most active organiser of Islamic events on British university campuses, thereby sidelining liberal Muslim student groups. This report should serve as a wake-up call for both university and student representatives, and will hopefully lead to a classification of the iERA as what they are – a fascist hate group on a par with the likes of Hizb-ut Tahrir, BNP and EDL”. 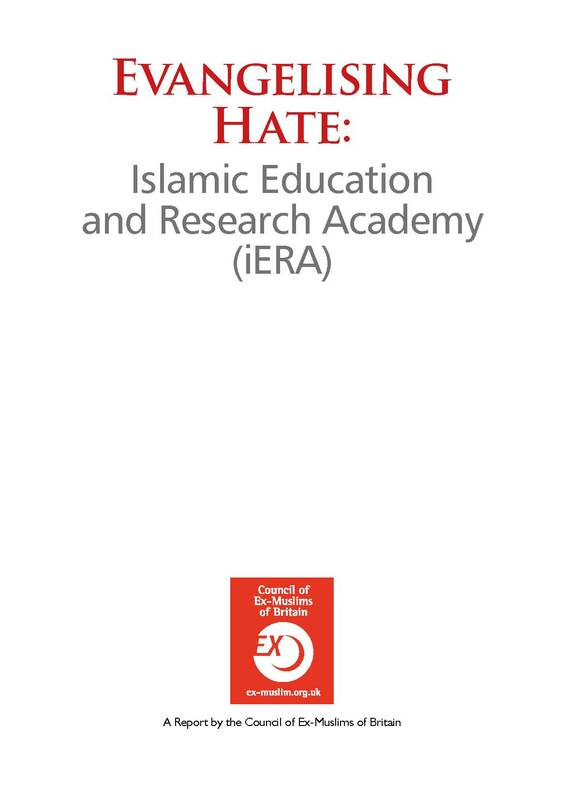 Gita Sahgal of the Centre for Secular Space says: “This excellent report lays out in gruesome and forensic detail the hate agenda of speakers associated with the iERA. They should never be legitimised as a charity or given platforms that treat their views as acceptable”. The iERA perpetuates a discourse that normalises hatred in religious terms, and sets the climate for “radicalisation”, bigotry and Islamism to flourish. Where groups like iERA have more influence, society is witness to a rise in everything from women and children wearing burkas, increased gender segregation at universities, legitimisation of Sharia-compliant wills and rules, acceptance of Sharia courts for the “Muslim minority” and the Islamisation of schools and mosques. This report makes clear that iERA must be classified as a hate group and have their charitable status withdrawn. These will help bring clarity to their agenda and can be a starting point for a wider investigation into the influence of Islamism in modern Britain. It is important to note that the CEMB publishes its report on a day that the far-Right group Britain First (an off-shoot of the British National Party) has targeted yet another mosque to bring its campaign of hate. Like Islamism, Britain First is a far-Right political group that asserts collective blame, incites hatred and dehumanises those deemed ‘other’. Just as Islamists do not represent a majority of Muslims or those considered Muslim, fascist groups like Britain First do not represent a majority of Britons. Our fight is against the far-Right of all stripes and variations – be it Britain First or iERA – and in defence of the rights of all people, irrespective of their background, race, belief, gender, sexuality… to secularism, universal rights and equality. Written by CEMB on November 25, 2013 . Posted in Press Releases, Resources. 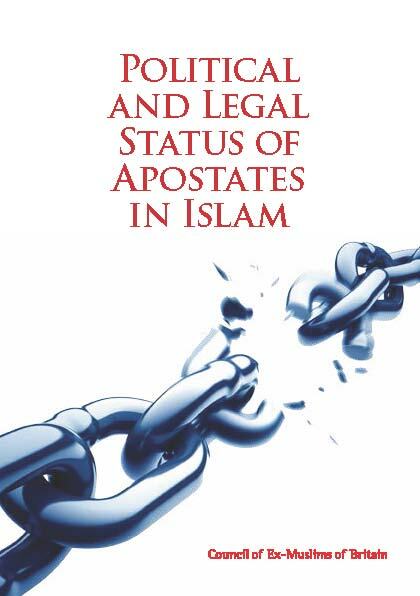 The Council of Ex-Muslims of Britain and Atheist Alliance International have just published a new report on the Political and Legal Status of Apostates in Islam with the support of The Richard Dawkins Foundation for Reason and Science UK. The report examines sources for laws that prohibit apostasy from Islam, reviews legislation and government policies in various countries that persecute apostates and blasphemers, and highlights the cases of some of the many persecuted individuals, with a focus on atheists, secularists and freethinkers.You can read it here. Written by CEMB on November 20, 2013 . Posted in Press Releases, Resources. Andy Thomson, author of the groundbreaking book, Why We Believe in Gods, is making the Urdu translation of the book available free of charge: WhyWeBelieveInGods_Urdu_Translation. 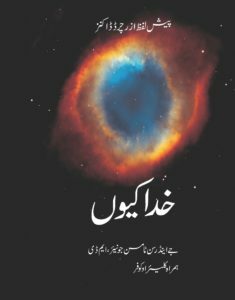 Print copies of the book will also be available for purchase via the CEMB with proceeds going to the organisation. A Council of Ex-Muslims of Britain member, The Rationaliser, has a new website to help with research on Islam or the Quran. The Rationaliser is especially interested in people contacting him with websites, documents, etc. containing other tafsirs or hadith collections which he might be able to incorporate. The far-Right and Islamists have similar ideologies, characteristics, and aims. Both rely on religion. Both use a language of hate and are extremely xenophobic, misogynist, homophobic, and anti-Semitic. Both rely on indiscriminate violence and terrorism to intimidate the population at large. They are dogmatic and punish free thinkers and dissenters. They use threats and scaremongering to push forward their agenda. Both are vehemently anti-working class and the Left. They believe in the superiority of their views and culture and deal harshly with anyone who transgresses… The world they have in mind is equally bleak, segregated, hateful and inhuman. And whilst there are obvious differences within far-Right and Islamist groups as there are in any phenomenon, the differences are not fundamental. The ‘hate cleric’ Anjem Choudhary supports stoning to death as do more ‘liberal’ Islamists like Tariq Ramadan. The ‘liberals’ have merely adapted their language to better dupe public opinion. The same is true with the European far-Right. There is fundamentally little difference between Anders Behring Breivik’s Knights Templar and the EDL or Stop Islamisation of Europe (SIOE). What they want is the same; the language they use is different. The EDL and SIOE are merely better at duping the public.You can read more about their similarities here. * A former high-up member of the BNP, Alistair Barbour, now supports the CEMB and One Law for All and blogs against the far-Right. You can see his excellent posts here. * CEMB member and founder of the Northern Ex-Muslim Meetup Group, Sandbad, recently posted a guest post on Alistair’s blog entitled “Righteousness in Islam and BNP“.